Vintage Racing Club of BC | ‘Battlin’ Bimmers’ are Back Oct 6th! ‘Battlin’ Bimmers’ are Back Oct 6th! 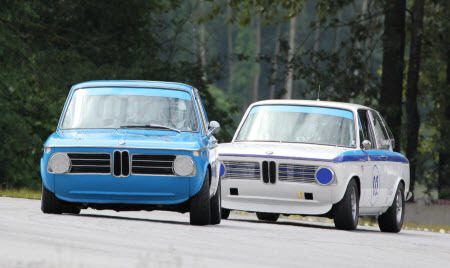 01 Oct ‘Battlin’ Bimmers’ are Back Oct 6th! The beautifully prepared ‘Battling Bimmers’ of Leigh Anderson and Ian Thomas are just two of the VRCBC racers already registered for the final Vintage races of the season at Mission Raceway Park Road Course on Saturday, October 6th. The Vintage races are part of the SCCBC’s season – ending ‘Flying Feathers’ Weekend. You can find the full race information and weekend schedule by clicking on ‘Driver Information’ on the SCCBC web site ( www.sccbc.net ) or just click here. Note: The Vintage races are usually held on the Sunday but for this weekend only, they will be on the Saturday. The Vintage races are on the Saturday because the SCCBC is bringing back the old Westwood tradition of ending the racing season with an Enduro on the Thanksgiving weekend. The last race on Sunday October 7th, will be the 4 Hour ‘Done Like Dinner’ Enduro (see the schedule for info) presented by Nixon Prosports Ltd. Attention Vintage Racers: There will be prize money! Maybe you should enter the Enduro too, and show those modern cars how it’s done – and also take some money home!